Atlanta’s Tony Cloninger is the only pitcher in baseball history to hit two grand slams in the same game. 1. Roger Connor of the Troy Trojans is the first major league player to hit a grand slam, keying an 8-7 win over the Worcester Ruby Legs on September 10, 1881. 2. Lou Gehrig hit 23 career grand slams, the most in major league history. Alex Rodriguez hit his 22nd career slam April 23, 2011. 3. Don Mattingly set a single season record with six grand slams in 1987 — the only slams of his 14-year career. Travis Haffner tied Mattingly’s record in 2006. 4. Four players have hit grand slams in their first MLB at bat — Bill Duggleby (1898), Jeremy Hermida (2005), Kevin Kouzmanoff (2006), and Daniel Nava (2010). Kouzmanoff and Nava hit their grand slams off the first pitch. 5. The Cardinals Fernando Tatis is the only player to hit two grand slams in one inning — both off Dodgers pitcher Chan Ho Park — on April 23, 1999. 6. Cleveland’s Elmer Smith hit the first grand slam in World Series history, Game Five against the Brooklyn Dodgers in 1920. Smith’s slam was overshadowed later in the game by Indians second baseman, who turned the only unassisted triple play ever in the Series. 7. Roberto Clemente is the only player in MLB history of hit a walk-off, inside-the-park ultimate grand slam, in 1956 for the Pirates. An ultimate grand slam is a walk-off slam for a one-run victory. 8. Tony Cloninger of the Braves is the only pitcher to hit two grand slams in a game, in 1966 against San Francisco. Yankee hurler Mel Stottlemyre is the last pitcher to hit an inside-the-park grand slam, in 1965 against the Red Sox. 9. Fred Lynn is the only player ever to hit a grand slam in the All-Star game. The Angels outfielder performed the feat in the 50th anniversary game in 1983. 10. Only twice have three grand slams been hit in a single game — Baltimore (2) vs. Texas (1) in 1986 and Cubs (2) vs. Houston (1) the following year. 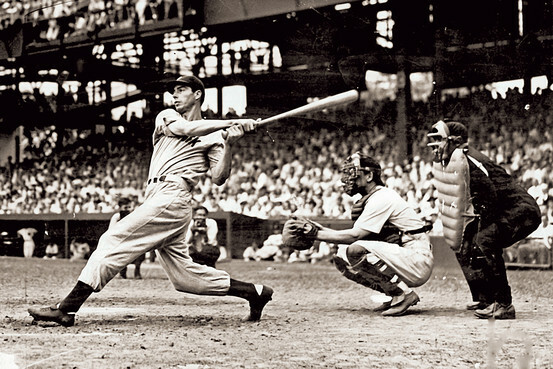 Joe DiMaggio’s 56-game hitting streak has held up for nearly 70 years. It’s one of 10 baseball records that will never be broken. People like top 10 lists. They’re neat and tidy. They cut to the chase. They can be controversial. And they work. Ask David Letterman. Throughout the past three years, the SportsLifer has posted a wide variety of top 10 lists. Here’s the top 10 of top 10s. SportsLifer also appears on Bleacher Report, and this blog earned a gold medal with more than 5,000 reads. And it’s been grounds for debate, soliciting 39 comments on the SportsLifer web site alone. Another Bleacher Report hit, this one led to a silver medal with 2,000 viewers. An early SportsLifer blog, posted after Brett Favre retired from the Packers. Upon further review and based on his ill-fated comebacks, Favre slips from third to fifth, behind Dan Marino and Otto Graham. One of the popular Lords of The Ringless postings, which also feature running backs, quarterbacks and MLB and NBA players. A natural rivarly and a natural top 10. Did you know Horace Clarke knocked in the winning run in the longest game the Yankees and Red Sox ever played — 20 innings. Art Monk, Washington Redskins wide receiver and NFL Hall of Famer, tops this homeboy list. This list was sparked by the Giants upset of the previously unbeaten Patriots in Super Bowl XLII. That epic ranks second behind the Jets win over the Colts in Super Bowl III. GOOD! HE DID IT! BRYCE DREW DID IT! VALPO HAS WON THE GAME A MIRACLE!” What a shot! Who knew “Old Eagle Eye” had nearly 3,000 hits and and still leads all first baseman in putouts and total chances. Beckley retired after the 1907 season. Remember. Bucky Dent’s home run in Boston in the 1978 Yankee-Red Sox game playoff game tops the list of games the SportsLifer has seen….in person. Earl Monroe shoots over Dave Cowens in 1973 Eastern Conference Finals. Here are 10 things you absolutely had to know about the playoff history between the Boston Celtics and the New York Knicks, the NBA’s two remaining charter franchises. The Celtics and Knicks are meeting for the 13th time in the playoffs. They split the previous 12, unless you count Boston’s 2-0 win in a curious 1954 round robin with the Syracuse Nats. Overall Boston leads the series 30-27. That’s second all-time to the 18th playoff meetings between Boston and the Syracuse Nationals/Philadelphia 76ers. They have met 18 times, though once since 1985. Boston faced New York for the first time in 1951, when the Knicks beat the Celtics, 2-0 behind Max Zaslofsky, a guard from Brooklyn and St. John’s, who averaged 17.9 points a game. The Knicks won the first three playoff meetings — in 1951, 1952 and 1953 — and advanced to the NBA Finals each year, losing all three times. Four times the winner of the Celtics-Knicks playoff series has gone on to win the NBA Championship — Boston in 1969, 1974 and 1984 and New York in 1973. Twice the series has gone seven games, in 1973 and 1984. The Celtics had never lost a Game 7 before 1973, but the Knicks marched into Boston Garden and won 94-78 behind Walt Frazier. The Knicks pushed the Celtics to seven games in 1984, but Boston dominated the finale and won 121-104 behind Larry Bird, right, who averaged a career post-season high 27.5 points that year. Knicks forward Bernard King averaged 29.1 points per game for the Knicks in the 1984 series, the highest single series scoring average in the history of the rivalry. The Celtics and Knicks last met in the playoffs back in the spring of 1990. Paul Pierce was 12 years old and rooting for the Lakers; Carmelo Anthony was in kindergarten. In 1990, the Knicks rallied from a 2-0 deficit in the best-of-five series and won Game 5 to break a 26-game losing streak over six years at Boston Garden. They say he died in his sleep, after watching his beloved Red Sox beat the Yankees one last time. Fred Turner, the longtime sports editor of the Sun Sentinel in Fort Lauderdale, passed away Monday after a long illness. He was 67. I had the privilege of working for Fred on the sports desk in the early ’80s, when every night at the paper was a new adventure. Fred was a bundle of energy, and his spirit was infectious. He made it fun to come to work. Fred taught me how to think outside the box, to take risks, whatever it took to make the sports section shine. And what a sports section it was. Great writers like Mitch Albom, Gene Wojciechowski, Bill Plaschke, and many others. Slot guys like Jeff Otterbein, now sports editor of the Hartford Courant, Mark Kazlowski, now at the Dallas Morning News, and Tom Christensen, Fred’s able assistant editor for many years. All worked for Fred and learned from him at the Sun Sentinel. Still hanging proudly on my wall is the “First in Sports” poster from 1982, when under Fred’s stewardship the Sun Sentinel won the Associated Press Sports Editors contest for best daily sports section in the country. In the spring of 1982, I received an offer from a paper in Virginia. Fred matched it, and so I decided to stay in Fort Lauderdale. Six months later, I received an offer to join IBM’s communications team. This time Fred told me to go, it was my time to move on, that IBM was a great company and that it was the right career move for me and my young family. Although I never regretted the move, sports blood still pulses through my veins, thanks in large part to Fred. Fred Turner was not only my boss and mentor, but a good friend as well. The sun isn’t quite as bright at the Sun Sentinel today. Safe home, Fred. Nobody in baseball history — not Cobb, not Ruth, nor Williams or Bonds — ever put together a better five-year run than Rogers Hornsby. Between 1921 and 1925, the St. Louis Cardinals second baseman won five consecutive batting titles — with averages of .397, .401, .384, .424 and .403. Overall the Rajah won seven batting crowns and hit .358 lifetime, highest for a right-hand batter in the history of the game. Led the NL in HRs in 1922 and 1925, winning Triple Crowns both years. In 1922, Hornsby led the league with 42 home runs, 152 RBIs, a .401 average and 450 total bases. Only Ruth with 457 in 1921, ever had more. Not too shabby. After winning his second Triple Crown and the NL MVP in 1925 with 39 homers, 143 RBIs and a .403 average, the Rajah’s numbers slipped to a more pedestrian .317 the following season. However, as player-manager he led the Cardinals to their first World Championship with a seven-game triumph over the Yankees. Hornsby also won the NL batting title in 1920, when he hit .370 and led the NL in hits, doubles, RBIs, OBP, slugging and OPS. Not even the great Ty Cobb can match Hornsby’s run of six straight batting titles, between 1920 and 1925. Throughout baseball history, other players have had remarkable five-year runs. Beginning in 1911, Cobb won five straight batting titles — .420, .409, .390, .368 and .369 — but couldn’t match up to Hornsby in some of the other categories. Babe Ruth won four home run titles, three RBI crowns and a batting title in his first five seasons with the Yankees, beginning in 1920. Ted Williams hit .401 in 1941 and won American League Triple Crowns in 1942 and 1947 (the only player besides Hornsby to win two), but lost three years to World War II service. And more recently Barry Bonds had a remarkable run between 2000 and 2004, capped by a record 73 home runs in 2001. But none can match the Rajah’s brilliant five-year run. Just before Christmas in 1926, Hornsby was traded to the New York Giants for Frankie Frisch and Jimmy Ring. Following the 1927 season, the Giants shipped Hornsby to the Boston Braves for Shanty Hogan and Jimmy Welsh. Hornsby played just one year in Boston. Despite winning his seventh and final batting title in 1928, Hornsby then was traded to the Cubs for Bruce Cunningham, Percy Jones, Lou Legett, Freddie Maguire, Socks Seibold and $200,000. That deal paid off handsomely for the Cubs, as Hornsby earned his second MVP in leading the Cubs to the 1929 World Series. Hornsby went on to manage the Cubs, St. Louis Browns and Cincinnati Reds, and was a coach for the original 1962 New York Mets. He passed away in 1963. Earlier this week, Derek Jeter passed a couple of ball players — Rogers Hornsby and Jake Beckley — to move into 33rd place on major league baseball’s all-time hit list. You remember Rogers Hornsby, the greatest right-hand hitter in baseball history,. Guy hit 358 lifetime and .424 in 1924, still the record for a single season. And Beckley. Well who the heck is Jake Beckley? Old Eagle Eye. Never heard of him. So for the greater benefit of society, we present 10 things you probably never knew about Jake Beckley. 1. Jake Beckley was born two years after the end of the Civil War in Hannibal, Missouri, the town that Mark Twain made famous. 2. He began his baseball career in 1888 with the Pittsburgh Alleghenys of the National League. The Alleghenys later became the Pirates. 3. In the spring of 1890, Beckley interrupted his NL career when he, along with eight of his teammates and manager Ned Hanlon, jumped to the Pittsburgh Burghers of the new Players League. 5 Jake married in 1891 but his wife Molly died after only seven months. He didn’t remarry until his playing career ended. 6. When he retired after 1907 he was baseball’s all-time leader in triples. He is still fourth all-time, behind only fellow Hall of Famers Sam Crawford, Ty Cobb, and Honus Wagner. 7. Beckley batted .300 or better in 13 of his 20 seasons. He hit .308 lifetime, and had 2,930 career hits. 8. Beckley’s reputation suffered because he never played on a pennant winner, and only one team he played for (the 1893 Pirates) finished as high as second place. 9. He held the career record for games played at first base until 1994, when Eddie Murray passed him. He still leads all first basemen in putouts and total chances. 10. Jake Beckley operated a grain business in Kansas City after his baseball career ended. He died at age 50 in 1918 of heart disease.